Q&A: What is the History Surrounding the Short Life of the Twenty-Cent Piece? Q: What is the history surrounding the short life of the twenty-cent piece? A: The why of the twenty-cent piece has long and often been debated. It was envisioned on the one hand as a means of preventing short-changing that resulted from the Western tradition of pricing items according to the Spanish “bit” (12-1/2 cents). On the other hand, its appearance has been attributed as the first step in the implementation of a proposal by Senator Sarent to mint all coins above the nickel in units of tens; that is, to mint twenty-cent and forty-cent coins, eliminating the quarter and half dollar. It was also viewed as an attempt by the senators from the silver states to legislate another guaranteed market for silver. 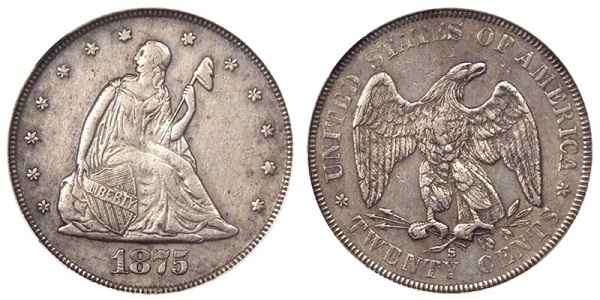 The coin’s short life can at least in some significant measure be attributed to the fact that while its value was prominently stated, and while the eagle on the reverse was left facing and the edge of the coin was plain, in contrast to the right facing eagle and reeded edge on the quarter, it was in practice easily confused with the quarter dollar, as its 22mm diameter was very close to the 24.3mm diameter of the quarter. Introduced in 1875, it was minted for general issue only that year and in early 1876; Proof specimens were struck in 1877 and 1878, after which time the issue was discontinued. Of the roughly 1.35 million minted for circulation, approximately 96.5% were produced at the western mints in San Francisco and Carson City.